Contacting customer service can often be a challenging experience, since the conversation engagement does not always meet the caller’s expectation. Waiting on hold, repeating information from one agent to the next, and generally spending too much time getting answers to questions can all lead to a lengthy and often frustrating customer journey. Today, AI is playing a role in improving this customer experience in call centers to include engagement through chatbots -- intelligent, natural language virtual assistants. These chatbots are able to recognize human speech and understand the caller’s intent without requiring the caller to speak in specific phrases. Callers can perform tasks such as changing a password, requesting a balance on an account, or scheduling an appointment, without the need to speak to an agent. Using Amazon Lex, a service that allows you to create intelligent conversational chatbots, you can turn your call center contact flows into natural conversations that provide personalized experiences for your callers. Using the same technology that powers Amazon Alexa, an Amazon Lex chatbot can be attached to your contact flow to recognize the intent of your caller, ask follow-up questions, and provide answers. Amazon Lex maintains context and manages the dialogue, dynamically adjusting the responses based on the conversation, so your contact center can perform common tasks for callers, to address many customer inquiries through self-service interactions. Additionally, Amazon Lex chatbots support an optimal (8 kHz) telephony audio sampling rate, to provide increased speech recognition accuracy and fidelity for your contact center interactions. Integration with Amazon Lex is available with Amazon Connect, a simple to use, cloud-based contact center service, but you can also take advantage of the 8kHz feature with Amazon Lex in your preferred call center solution. Amazon Lex chatbots use advanced deep learning functionality to convert speech to text, trained on telephony audio (8 kHz sampling rate) to improve speech recognition accuracy and fidelity for your contact center interactions. Amazon Lex chatbots can understand the caller’s intent, improving the success rate of self-service interactions and solving the majority of your customer’s requests via self-service, so your customers spend less time waiting on hold and more time using your products. You can customize your caller’s experience with the Amazon Lex chatbot, to fetch information from a scheduling system or database with customer or account information. For example, your call center chatbot can confirm or change appointments, check account balances, or create a new account. By adding an intelligent conversational chatbot for self-service, you will improve the customer experience and increase contact center efficiencies. 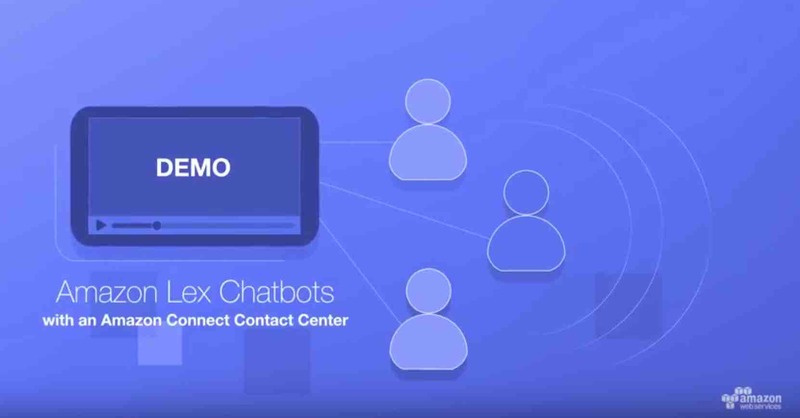 This presentation provides a demonstration on how to use an Amazon Lex chatbot with an Amazon Connect contact center. 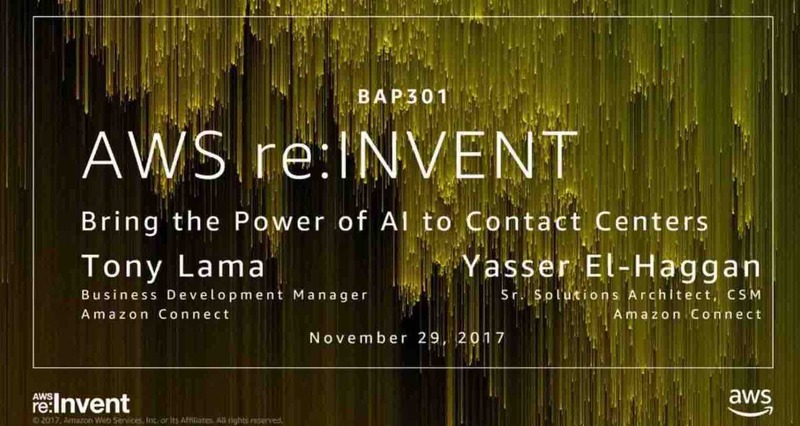 This presentation shows you how to create dynamic contact flows in Amazon Connect while personalizing the caller experiences with an Amazon Lex chatbot using caller history and responses to anticipate their needs. Example of an Amazon Connect contact center using Amazon Lex for natural conversations. You can build an Amazon Lex chatbot quickly. Self-service graphical interfaces make it easy to design and implement Amazon Lex chatbots in Amazon Connect. Context and dialogues are shared across Amazon Connect and Amazon Lex, making the caller experience seamless. You can build your own chatbot on AWS using Amazon Lex. Try it today!